Finally, a solution that will help you transcend to your highest level of trading. Modulus Trading Solutions are for only the most advanced quantitative traders and fund managers - the top 1% who are consistently profitable. It is for those who demand absolute control over all aspects of their trading system design, development, testing, simulation, live trading, and walk-forward optimization. In designing our trading platform framework, we sought the guidance of our most successful clients. Your expert knowledge, intuition, and creativity are what make you a successful trader. Even the most expensive off-the-shelf software holds you back, limiting your ability to develop, test and implement imaginative new strategies in a novel way. Modulus Trading Solutions help successful traders generate more alpha by removing virtually all limitations and barriers. Modulus helps optimize the speed of processing and transacting through the use of high performance computing techniques, utilizing both software and hardware systems. Modulus works for you without limitations... no matter where your imagination and opportunities take you. Monitor and optimize all trading system variables. Simulate specific market conditions. Test disaster scenarios. Equities, options, futures, FX, cryptocurrencies, baskets, custom synthetic instruments, and more. Control where orders are routed. Keep a watchful eye on strategies. Identify when market dynamics begin to change. Our trading solutions provide bridges to popular market data vendors, as well direct market access (DMA) adapters, for ultra-low latency. FIX adapters for many brokers, as well as DMA connectivity options, are also available. Our solutions are typically installed in close proximity to, or within, market exchange buildings. Historic market data is provided via the Modulus Real-Time Data Server. Our trading solution framework allows for visual drag & drop system programming, and programming with TradeScript, C#, C++, F#, R, and Python programming languages. Data is accessible through our integrated time-series database with visual rendering of results in our award-winning chart library, which can display millions of points. 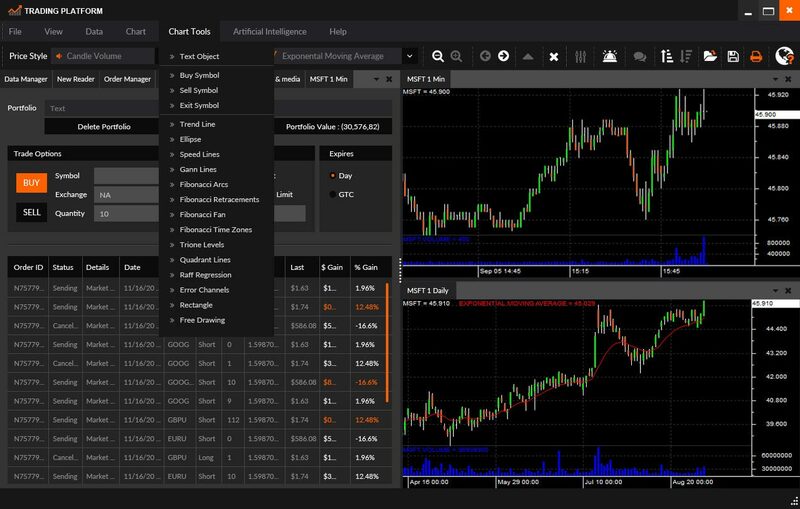 Program powerful trading systems that make use of machine learning, inter-market analysis, multi-time-frame analysis, and real-time, tick-by-tick market scanning. Implement powerful neural networks and genetic algorithms for deep learning, natural language recognition for ultra-fast sentiment analysis, rough set theory, fractal and cycle analysis, pattern recognition, plus more. With Modulus, you can exploit even the most highly efficient markets. Modulus Trading Solutions are designed for high frequency trading of equities, futures, options, forex, and cryptocurrencies. For ultra-low latency, our custom hardware solutions are capable of generating signals in less than 30 nanoseconds, providing for absolute minimal slippage. Our industry-leading HFT machine learning system is based on IBM Power9 processors and FPGA algorithms. The system is capable of running at multi-port full-duplex rates of 140 Gbps at 156.25 MHz from an FPGA to an industry-standard multi-mode fiber optic cable for direct network, low latency, in-the-pipe processing of ultra-low-latency, high frequency trading strategies that utilize extremely fast out-of-sample feed-forward neural network signal processing. Financial Software Development Components Offered by Our Sister Company, Modulus Financial Engineering, Inc. The preferred programming language for traders: flexible, powerful, easy to learn. Our award-winning financial chart library with powerful features and tools built-in. Our award-winning technical analysis library, which is completely customizable. Our solutions are based on many years of experience in the technology industry. Our products and services are provided by developers and engineers who have first-hand experience in using the systems that they create. Everyone at Modulus speaks your language. Client confidentiality is important to us, for small firms to top hedge funds alike. We provide an ironclad Non Disclosure Agreement (NDA) to all clients. Also, we take pride in being highly accessible. With Modulus, you will never be redirected to an outsourced team, and you won't find a problem we can't solve.